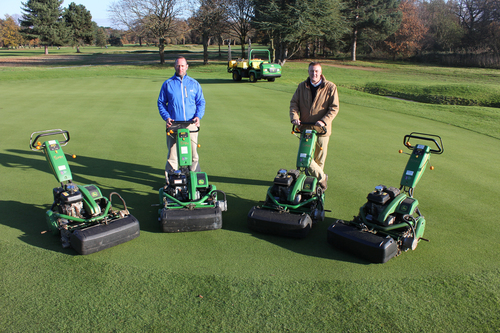 A set of four John Deere 220E hybrid walk-behind greens mowers have played a major role in a £1.7 million course reconstruction project at Royal Mid-Surrey Golf Club in Richmond. Course manager Gavin Kinsella leads a greenkeeping team of 14 on the 18-hole J H Taylor and Pam Barton courses, both of which were originally designed by the club’s first professional J H Taylor, who won five Open Championships spanning the 19th and 20th centuries, and captained Great Britain’s Ryder Cup team in 1933. Fully re-opened last summer, the J H Taylor Course now features 18 USGA specification greens, the culmination of a seven-year project completed by golf course architect Martin Ebert of Mackenzie & Ebert, consultant and project manager Charles Henderson of Sports Agronomy Services, and main contractor M J Abbott Limited. The new 220E greens mowers, featuring fully floating cylinders fitted with John Deere’s Quick-Adjust QA5 22in reels, were specified for the job of cutting the reshaped and reseeded greens as establishment progressed on the front nine holes during the second phase of the project, which originally started with work on the back nine in 2009. Gavin Kinsella takes up the story: “Before the reconstruction project started, the club had never really cut the greens by hand – triples had always been used except on very special occasions. However, after all the greens, surrounds and bunkers on the back nine holes were completely redesigned and seeded for the first phase, we had to use hand mowers for the initial cuts while the grass was getting fully established. “Once this process accelerated, while the greens were still soft and the grass still young and quite fragile, it became clear that the John Deere 220C fixed reel mowers we had at that time weren’t getting down to the cutting heights we wanted – we just couldn’t go low enough, soon enough. This meant that, when these nine holes were opened for play the following year, we had to put up with quite slow greens for the first year or so – some members even commented that the back nine putted like Velcro! “When it came to looking at available resources for project management of the second phase on the front nine holes, the one lesson we learned from the back nine was that having the right machinery for mowing was critical. We therefore decided to invest in the new John Deere walk-behind greens mowers with floating heads, which gave us much more scope to deliver the surfaces we wanted. “Six months after the seed hit the ground we were able to manage the greens much more intensely in similar conditions to phase one, but with no scalping, no scars and no scuffs. The 220Es’ floating heads worked much better over our signature mounds and undulations, and they allowed us to cut a lot lower, even down to 3.8mm, a lot earlier. “When we opened the front nine holes on schedule last summer, they were already six months ahead of where the back nine was at the same stage, and the only variable was the machinery. The greens were not only opened on time, they’re now faster and better paced, and consistently smooth and true. “We’ve also had groomers fitted to all four mowers, which are set level with the base of the rollers, below the height of cut, almost at ground level when cutting the back nine holes. This is quite aggressive, admittedly, but it works for us and it leaves these more well established greens looking really clean and tidy.